Over more than the past decade, there have been persistent efforts to realize anywhere-anytime broadband wireless Internet access. For example, there has been the migration from 2G (second generation) to 3G (third generation) in cellular networks; and there has also been the boom of WiFi (IEEE 802.11) hotspots. 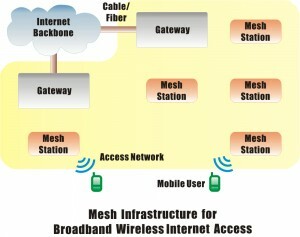 However, the limitations have been apparent: the evolution of cellular networks could not escape the inherent bandwidth limitations; and WiFi hotspots could not overcome the limited service coverage, where broadband access (over 200Mbps in the latest standard) is only available within about 100- meter range of the service access point in a WLAN (Wireless Local Area Network).